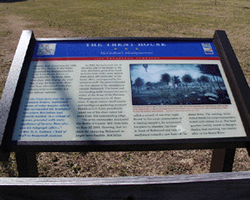 Between June 12 and June 28, 1862, Union Gen. George B. McClellan maintained his headquarters here at the Trent House. Known as “Reynoldsville,” the house dates from about 1825. During the Civil War, it was the home of Dr. Peterfield Trent who served in the Confederate army as a surgeon in a local defense regiment. In 1862, the main road ran on the other side of the house to the west. McClellan pitched his headquarters tents under some walnut trees about 100 yards east of the house. Here, accompanied by his extensive staff, the general planned the final phases of his campaign to conquer Richmond. The house and surrounding fields became the nerve center of the Army of the Potomac. Telegraph wires ran in all directions; a signal station stood nearby and intelligence-gathering aeronaut Thaddeus S.C.Lowe periodically raised one of his observation balloons from this commanding ridge. The army commander monitored the Battle of Gaines’ Mill from here on June 27, 1862. Knowing that his plans for capturing Richmond no longer were feasible, McClellan called a council of war that night. Joined by his corps commanders at a roaring campfire, he announced his plans to abandon the lines in front of Richmond and retreat southward toward anew base on the James River. The meeting, which disheartened the corps commanders, lasted until almost 2 am. The headquarters facility moved to Savage’s Station that morning, and shortly after to the James River.